Home » Uncategorized » Are you getting any return on your social media efforts? Just read a fascinating article about the value of social media globally. It was interesting in the first instance to discover how many businesses don’t measure the results of their funded strategy. Crikey! 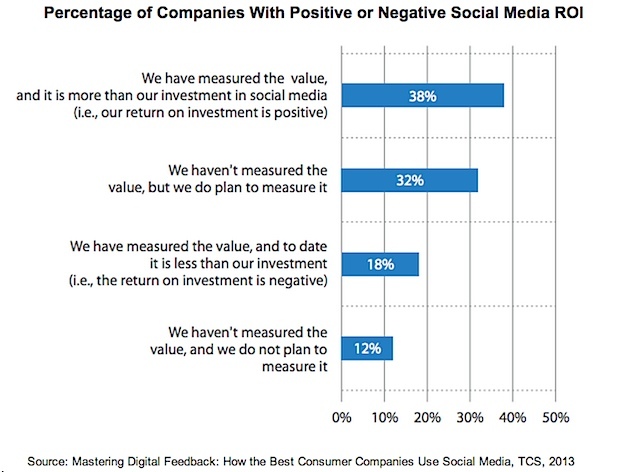 Second interesting thing; some 38% of large consumer companies report a positive return on their social media investments Now that was twice the number that reported that the effort was more than the gain. And Asia-Pacific headed that list with 55% of surveyed companies rating their Social Media strategies as a positive activity. However, 44% of consumer companies haven’t yet measured the return on investment of their social media efforts according to this survey by Tata Consulting Services. 12% have no plans to measure the return. I wonder how much efort that 12% put into their strategy – and what else don’t they measure. It strikes me that whatever you are putting time or effort into in terms of recruiting customers or driving your business, if it’s worth doing, it’s worth measuring. Few strategies will draw a clean line between their effort and an action. This is particularly true when it comes to marketing. I place the ad, the phone rings. No? Because consumers draw on a number of stimuli for their decision making. But we can make an educated guess.